Is there an app that will notify me (in notifications center) if a process is using up a high percentage of CPU for a specified amount of time? The other day, I was sitting in a coffee shop working, when I looked down to find that 25% of my battery was left. I looked at my Activity Monitor and saw that the time machine process was going at 90% for a while (as long as I was watching it). Are there any apps that can notify me if a process is at a certain level for a certain amount of time? 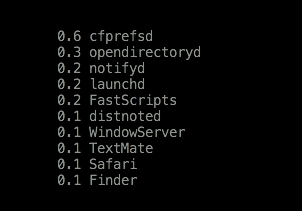 If the average CPU use in the last three samples is over 50%, it uses terminal-notifier to display the processes that used the most CPU. What's an effective way to proactively spot runaway processes?